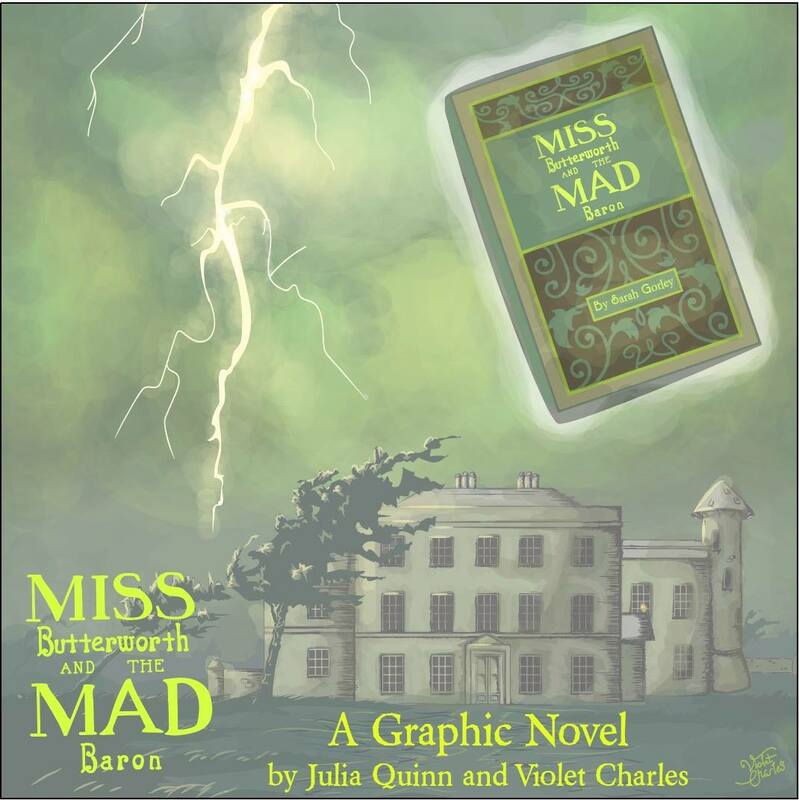 Miss Butterworth and the Mad Baron will be a graphic novel! It’s official! Miss Butterworth and the Mad Baron is going to be a GRAPHIC NOVEL! JQ is extra excited about this — especially as it’s a collaboration with her sister Violet Charles of comics renown. It will be well over a year before publication. As of now there is no firm release date, but as soon as any pre-order links become available we will of course post them here. How can you see sneak peeks? JQ may post the occasional illustration on both Facebook and Instagram, but Violet will be posting tidbits about the project considerably more often, and JQ highly recommends fans of Miss Butterworth follow Violet on social media, specifically: @violetcharlescomics, fb/violetcharlescomics, or to see sneak peeks first as well as exclusive outtakes, follow Violet on Patreon. Update: The sale has ended but be sure and sign up for Julia’s site news so you don’t miss a thing! If you’ve been meaning to start the Smythe-Smith or the Ladies Most series, now is your audio opportunity! 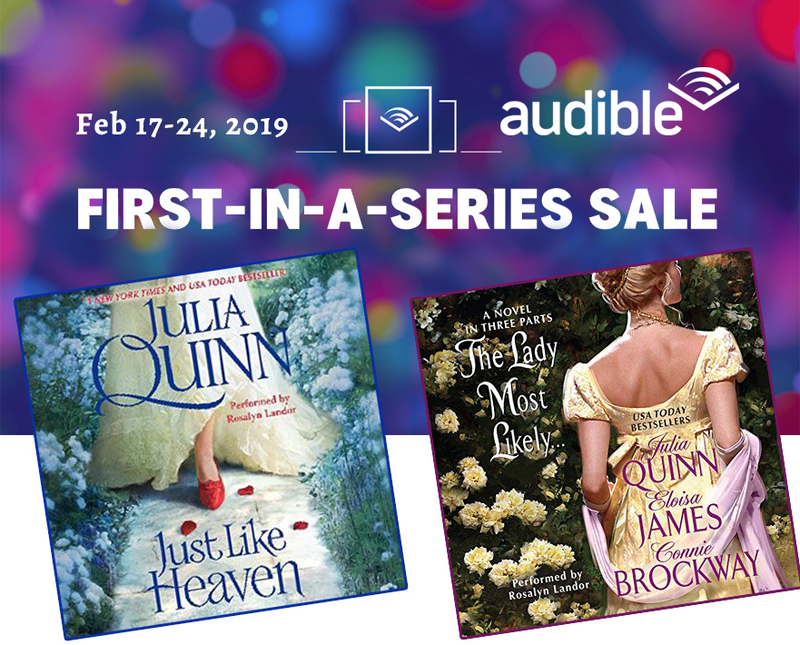 Audible is including both Just Like Heaven and The Lady Most Likely… as part of its “First in Series” promotion. If you are an Audible member, these titles are priced at just $7.95 through Sunday, February 24. * Thanks, Audible! And a bit of nice news: Romancing Mr. Bridgerton, was chosen as a Valentine’s-Must-Read by NPR Books. Thanks NPR! *Must be logged into Audible to see sale prices. OTHER MISS MUSIC: JQ listened to a few songs on endless repeat while writing Poppy & Andrew’s story. Check out the newly posted soundtrack for The Other Miss Bridgerton. MEET JQ! Last fall JQ announced she would be attending KissCon in Chicago in April. Now she’s added February 10 to her Event Calendar. If you’re in the greater Indianapolis area, get a jumpstart on your Valentine’s Day Celebration at an open-to-the-public library event. LOVELY MISCELLANEA: The week it debuted, The Other Miss Bridgerton sailed onto The New York Times list at a fine #9. And in the December 3 issue, Women’s World featured The Other Miss Bridgerton as a top pick. Do you ever wonder about the research? You can now find out more about what went into the writing of The Other Miss Bridgerton in JQ’s Inside the Story. If you haven’t yet read The Other Miss Bridgerton and fallen in love with Poppy & Andrew, what are you waiting for? Buy it right now and get reading! The Other Miss Bridgerton! Now Shipping and Downloading! 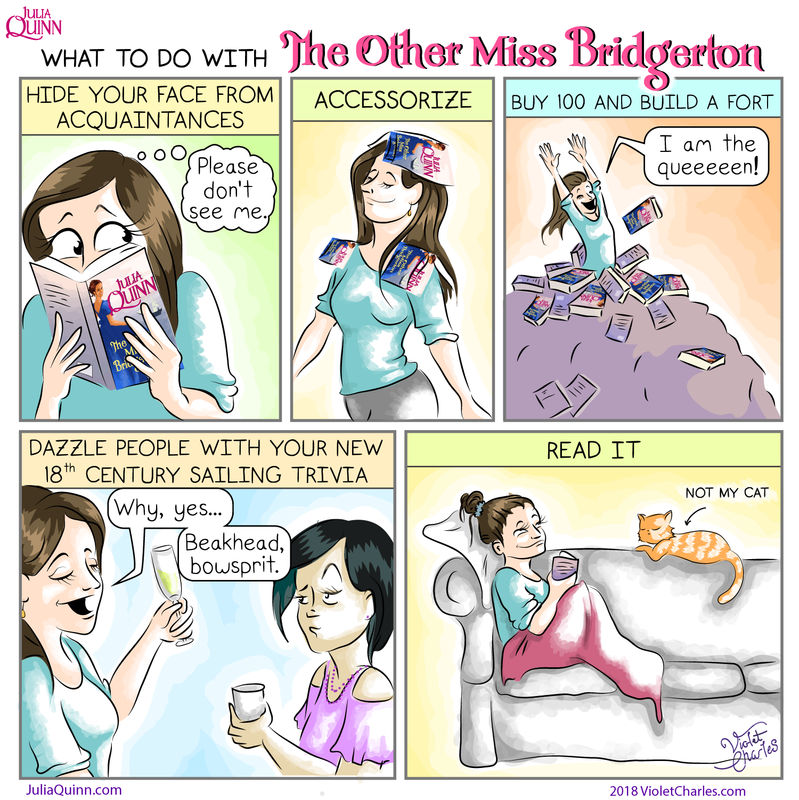 No other book will do — The Other Miss Bridgerton is now in stores! You can finally buy it and read it cover to cover! Want an autographed copy? Of course you do! JQ happily autographs and personalizes books ordered through the University Book Store in Seattle. And every order comes with a Bridgerton bookmark and a limited edition All Aboard magnet. 1. Listen to an audio clip from The Duke and I, the novel that introduced Bridgertons to the world. 2. 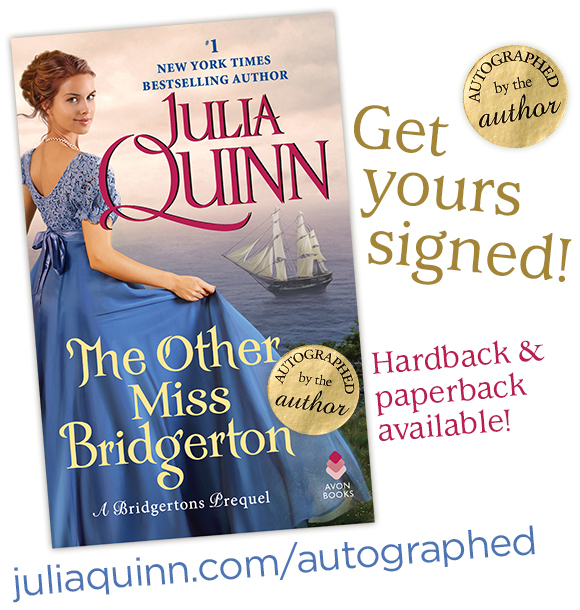 Pre-order an autographed copy of The Other Miss Bridgerton in paperback or hardcover. Bonus: You’ll get two JQ Keepsakes: a Bridgerton Bookmark, and (for pre-orders) an All Aboard fridge magnet. 3.  Check out the list of all JQ’s books in setting chronological order. Then, for kicks, re-sort alphabetically by hero. Because haven’t you always wanted to read a list of JQ’s books sorted alphabetically by hero? 4. Skim all eight story summaries for the Bridgerton Second Epilogues to make sure you didn’t miss one. 7. Skim through all 13 Bridgerton FAQ — there’s bound to be stuff you didn’t know. 8. Subscribe to JQ’s site news so you don’t miss any newly posted content — This is different from JQ’s newsletter, which you are probably subscribed to already. What? You’re not? The next one comes out in just a few days, so get signed up now! And GET PSYCHED FOR TUESDAY! We’re just one week away from RELEASE DAY: November 20! In a Starred Review, Publishers Weekly declares Poppy & Andrew’s story “a real treat for Quinn’s fans and anyone who loves historical romance.” Team JQ thinks it’s high time everyone meets Captain Andrew James Rokesby, who makes his entrance in Chapter Two. READY TO READ: Chapter Two has just been added to the excerpt for The Other Miss Bridgerton. Yay! Place your pre-order so you can go right on to Chapter Three as soon as the book becomes available. Want it autographed? We’ve got you covered. UPDATE, NOVEMBER 12, 2018: JQ’s Veterans Day Giveaway has ended. Thank you to all the soldiers, veterans, military spouses and Gold Star family members who entered. All prizes will be mailed or emailed by December 31, 2018. From the bottom of our hearts, thank you for your service. November 11 is Veterans Day. 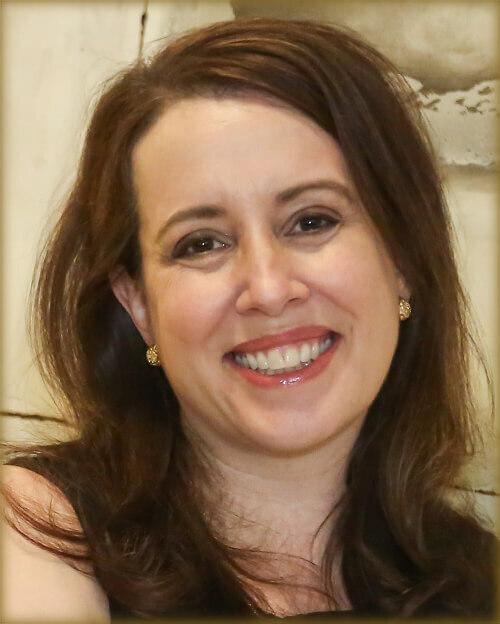 Please join Julia Quinn in her eighth annual giveaway celebrating readers within the United States armed forces. Veterans, soldiers, military spouses and Gold Star family members are invited to enter to win their choice of JQ novels. One hundred books. One very heartfelt thank you. Release day is not so far away, but you can start reading The Other Miss Bridgerton right now! All of Chapter 1 is now posted at JuliaQuinn.com — and when you reach the end, the pre-ordering links are right there so you can make sure you can keep reading the minute the book is released on November 20. This is the third book in the Rokesby series, but they can be read in any order. If you want to catch up on the other Bridgerton prequels, here are two great reasons: The Girl with the Make-Believe Husband (book 2) is on sale, and Because of Miss Bridgerton (book 1) recently became a #1 bestseller in Brazil. So much to enjoy: Read an excerpt from The Girl with the Make-Believe Husband, explore the book extras, listen to songs from the soundtrack, and buy your copy in your favorite e-reader format today!  Get notified whenever new content becomes available: events, cover reveals, new excerpts, great press...Whenever the home page is updated, you will be, too—one to three times a month. This is different from the JQ newsletter, which requires a separate subscription. How do I sign up for the JQ Newsletter?